The Mission of the Milan Village Arts School is to engage people in the practice of traditional, contemporary and folk arts, fostering prosperity, community and culture in our region. The idea of an arts school in Milan began at a 1988 community economic planning meeting hosted by Community Education Director, Bev Struxness. Milan was no different then many small rural towns in western Minnesota that were losing population to better economic opportunities elsewhere. Local businesses were closing as the economic realities of agriculture called for larger and fewer farms. But, Milan residents were determined to keep the quality of life they valued alive and flourishing. Citizens throughout the region valued their Scandinavian heritage and the artists who practiced the ethnic folk arts that was a part of this heritage. A decision was made to help the many artists in the area by starting an arts school. The husflids or folk schools of Norway became the model for the Milan Village Arts School. Since 1988, the school has hosted classes for over fifty teachers, with student enrollments well into the thousands. 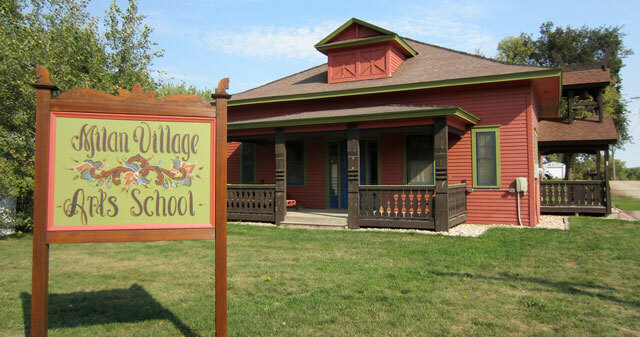 In 1995, Milan Village Arts School purchased the District 49 country schoolhouse built in 1915 for $50. The city of Milan generously donated land and the school was moved to its current location. Volunteers spent hundreds of hours helping to refurbish the old schoolhouse. Aaron and Arvid Swenson of Flom, MN, refurbished the school’s porches and bell tower in traditional Norwegian style. Dr. Frank and Linda Brathen donated the country school bell that adorns the building. Metal worker, Gene Sandau of Madison crafted the clapper. Area artists painted the building in its attractive Scandinavian inspired colors. Through class tuitions, grants, memberships, donations and volunteer energy, the school has brought people to the community, helped to make it a better place to live, and made the appreciation of art an integral part of the community. The school offers a venue for local citizens and people from all over the United States to take classes. MVAS also participates in community events such as Syttende Mai in May to highlight the creative heritage of our community, and the Upper Minnesota River Art Crawl in the fall to build a market for our region’s arts. Browse through this year’s list of classes, sign up and join in the appreciation of the prairie, its heritage and take the opportunity to learn and practice creative and artistic pursuits of all kinds.